Recently, GW published their process for painting Flesh Tearer Space Marines. This could not have come at a better time for me. I was planning on starting a small squad and seeing this article pop up in White Dwarf was absolutely perfect. The picture above is from that issue of White Dwarf and explains how they go about painting their models to get the appropriate look. A quick look through the process and it didn't appear to be too difficult. I did question the order they did some of their steps in though. I've talked about this before when it comes to painting certain things first and the order things should go in to make it as painless and as easy as possible. The Back to Basics series covered this in depth, but the Light colored primer post really outlined why things are painted in a certain order. So, I took their process and changed it around slightly to accommodate my needs and came up with this process for the armour. While it may look like it has more steps and is more work, it's because broke them down to show the differences between each step involved. 1. Basecoat the red areas with Mechrite Red. I decided to start with the red as well with this guy since it covered more of the model. This means I would have to finish the metal and black areas carefully. If I'd gone the other way, I could have done all the metals and black portions quick at first but would have had to work with the red areas carefully. It comes down to your preference. 2. Go over the Mechrite Red with Red Gore and then clean up your work with black. The Red Gore is a bit darker and cooler than the Mechrite is and really gives them that dark feeling in the end. If you're looking to just get close and keep the steps to a minimum, you could cut out this step and still end up with something close. 3. Silver over the metal areas. 4. Now wash the whole thing with GW Badab Black. Instead of having to do the red areas at one time and the metals at another, the whole thing is done right now. I was a bit more careful in my application of the Black wash and tried to keep it to the recessed areas on the red armour. 5. Add your Bleached Bone highlights. Boy does this guy look funny at this stage. You would think whoever told you to do this was wrong when you look at the model after this step. Try and keep them thin and clean, it helps with the final look of the model. 6. Wash the highlights with Baal Red. I made two passes over the highlights in oder to get them to blend in nicely. After that, it's a matter of finishing off the details like skin, iconography and such with whatever formulas you may use. The base on this guy was done just as quick with a focus on good results in a few steps. 1. Basecoat with a light grey color. 2. Wash with thinned GW Charadon Granite. 3. Add shadows to the recessed areas using a variety of 3 GW wash colors. Badab Black, Devlan Mud and Gryphonne Sepia. Once that dries, take your original light grey color and do a quick drybrush to pull some of the details back out. Not bad for quick tabletop results and he matches the "Official" GW scheme as well. I'll be honest, I really like the color scheme these guys have. I'd go so far as to say they are up there in my top 5 color schemes. Excellent job, Ron. Really like how the red turned out; contrasts nicely with the black. Please share your top 5 (I'm assuming space marine) color schemes; would be interested to hear. Gary: I'll get them posted up in the coming days then. Mister Feral: Thanks. It is fairly easy too. I hate seeing cool painted models with no holes in guns. Ruins the effect for me. Otherwise an excellent tutorial! They look great! I can never seem to get Mechrite Red to look like anything except a washed out pinkish color. Nice use of the Chapterhouse jump packs- I have a set myself and they are sweet! Zigmunth: This was for the painting aspect only... I even left out the extras and focused solely on the armour itself. Side note: the barrels have been drilled out now. deathkorps: They weren't too bad to clean up... the little pointy bit in the center of the intake can break if you're not careful, but they are fairly easy to work with and produce some nice results. blang86: I'll have to look at them. Julian: Thanks. We all have our own ways of getting models painted. With someone else's technique, sometimes it just takes making some minor adjustments to make it work for you. How do you paint the melta barrel to get that burnt effect? Aeteros: Here's the tutorial for the soot stained gun barrel look. Aeteros: Glad it helps. It is a simple effect that can add some life to your model. Anton: I never thought about that... I don't cross over to Chaos enough to think of those kinds of things. blang86: I took a look at some Angels Sangiune models, they look like thy could be done just like this. Their half and half scheme is pretty cool looking too. 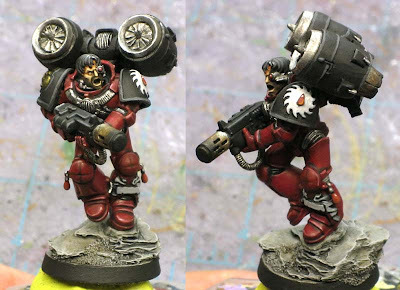 nice tips there ron, might have to pinch it for the red hunters (assuming the guard ever get finished) as this looks nice and dark like im after. also any plans for a similar article on tanks and vehicles in a similar scheme? millest: Thanks. No plans right now for anything vehicle related on this, but you are not the first one to ask me about since posting this article which is a bit surprising. I think the process would scale up nicely though and I don't see any issues with using it on vehicles and model with larger, unbroken surface areas. I am curious, what color primer did you use for this squad? Brave Rifles: I used a light grey color primer. That way, I did not have to use a bunch of basecoats to get a nice solid red color. Glad it helped, thanks for stopping by!